Thank you for visiting the North American Steel Interstate Coalition's Steel Interstate web site! This page explains who is behind this work. To learn about the Steel Interstate Concept, please click here. RAIL Solution is the founding partner of the North American Steel Interstate Coalition (NASIC). RAIL Solution is a not-for-profit, non-partisan, citizens organization. It has no relationship with any railroad or transportation company. The group formally organized in Virginia in 2003 to oppose more than doubling the size of primarily rural I-81 into a truck tollway with four exclusive truck lanes. 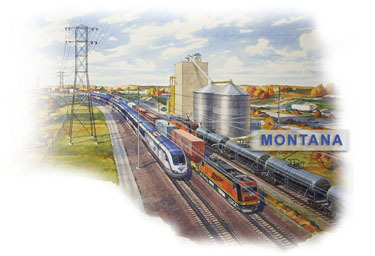 RAIL Solution offered the Steel Interstate railway as an alternative to moving projected freight growth on I-81. Still others have voted to join NASIC, but have not yet developed their regional initiative pages. We urge your citizens association to join our partnership to get America on track towards a faster, cleaner, greener, cheaper, oil-free and economically secure transportation future. Check back to this page to see other groups joining across the nation -- click here to contact a representative.